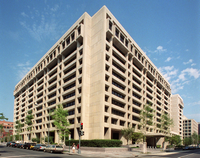 The International Monetary Fund (IMF) has recently responded to criticisms of its policies toward the world's least developed countries (LDCs), by reforming its approach (.pdf) to "development" lending. The fund has long been a favorite target of civil society groups, who claim that the institution has no expertise in formulating development policy, that its stringent conditions often worsen already dire economic situations, and that its governance structure is highly undemocratic. The fund, they often seem to argue, should either be overhauled, or removed from LDC lending altogether.